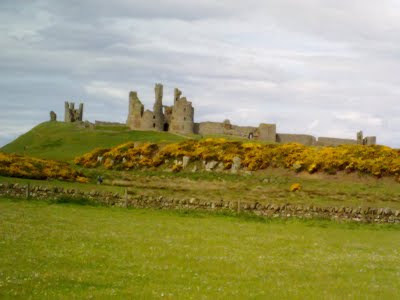 Sandy beaches, grassy paths, golf courses, a castle and Northumbrian Police 'No Camping' signs featured on today's amble. On my right, the beaches were almost deserted; on my left the golf links were crowded; and on the path, the centre of my universe, I met other walkers. They were heading in the opposite direction (I don't do overtake) and most have time for a chat which immediately confirms that they are not fleeing from something terrible. Reassured, I reflect positively that a lone walker's walk is not a lonely one. I like the local accent; softer than the Geordie accent further south, it's friendly, cheerful and engaging. Not always though. Mrs Grumpy Golfer cautioned me from afar today. Stetched out on the seaward side of the path, like a beached whale looking out to sea, my day dreams were angrily interupted by "You can stay there if you want but you could get hit by a golf ball mind!" I swung my rucksack on and lumbered off, thinking only of all the things I could have said. In the pub this evening, harmony of mind and soul was restored with the passing of time and a little alcohol. I'll raise a glass both of you in the next pub. Craster to Embleton is a class walk.